I’ll be on DC’s NewsChannel 8 in the 7:30p ET half-hour — their Federal News Tonight program — and I’ll be talking about dashboards. * What is a dashboard anyway? What’s new here? * Why are these useful? * Didn’t the Federal CIO Vivek Kundra use a similar kind of IT governance process when he was the chief technology officer in Washington DC? This grows out of a speech last week by Federal CIO Vivek Kundra, speaking at ACT/IAC’s Management of Change 2009 conference in Norfolk, VA last week. 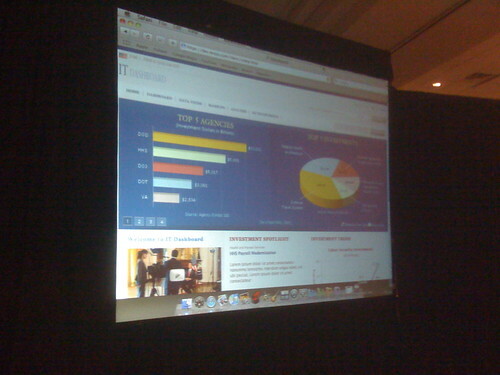 During his speech, he gave the audience the a preview of a dashboard that will track IT systems. Essentially, the dashboard is the Obama administration’s IT governance. Essentially, the dashboard will be something like the Bush administration’s scorecard, but it will be more real time and it will be more transparent. And the idea of the dashboard builds on the concept of the dashboard of your car — something that gives you data that lets you make management decisions. Curiously, there are many people who have been somewhat flummoxed by the concept of the dashboard. I have to imagine that this process will give additional visibility into how IT systems are progressing. Often, the data for the Bush administration score card would go disappear into OMB — and people weren’t really sure what happened to it. It was often unclear what an agency could do to improve. And people often felt as if once they got onto the OMB management watch list, it was like crazy glue — you couldn’t get off the list. The more transparent dashboard should highlight what is working — and what isn’t. Totally new, innovative ways to manage IT portfolios were created and used to ensure all stakeholders could evaluate the technology program and better make informed decisions on when to terminate programs and where to invest more money. Chief among these innovations was an approach to portfolio management that replicates a stock market trading floor. More important, however is the relentless focus on performance and innovation to support performance. Beside rethinking these notions of governance Vivek also took measures to smartly watch/reduce/reprioritize IT costs. * Daily Debrief: Dashboards: coming soon to an agency near you? We spoke to John Cimral, the former CEO of ProSight, which created a commercial software product for creating these dashboards. The company has since been bought by Oracle and Cimral has moved on, but we asked him for insights about how difficult it is to create these dashboards. Hear that conversation here. The General Services Administration has named Danielle Germain as the agency’s chief of staff, replacing Cathleen C. Kronopolus, who has been acting chief of staff since January. Most recently, Germain worked at the National Academy of Public Administration. Previously, he worked at the American Council for Technology/Industry Advisory Council. The GSA chief of staff job is a key post. Remember that GSA administrator nominee Martha Johnson served as the GSA chief of staff under former administrator David Barrum. But another person who served in that post: David Safavian. WASHINGTON — The U.S. General Services Administration announced the appointment of Danielle M. Germain as Chief of Staff, effective immediately. In this role, she will oversee the Office of the Administrator, ensuring effective and efficient staffing of agency programs and projects, guiding the agency’s continuity of operations planning and emergency response efforts, and maintaining liaison and facilitating coordination with GSA’s 11 regions. Before working at the National Academy, Germain served in management positions at the American Council for Technology/Industry Advisory Council; the Council for Excellence in Government as the Director of Technology Programs; the Information Technology Association of America (now TechAmerica) and IBM’s Office of Governmental Programs. Germain also served as a congressional aide to Sen. Edward M. Kennedy. A native of Nashua, N.H., Germain earned her master’s degree from the Johns Hopkins University School of Advanced International Studies in 1998 and a bachelor’s degree from Mount Holyoke College in 1993. Meanwhile, all eyes at GSA are on the Senate, where Martha Johnson is expected to be confirmed as the new GSA administrator. Yesterday, Johnson was approved by committee.